On Chaweng Beach you'll find every type of accommodation, from 5 star branded resorts to local budget bungalows. You're never short of something to eat or drink either, there's restaurants and bars running the full length of the beach. Chaweng has a great atmosphere about it, whether you prefer chilling to laid back tunes on a sun-bed with a cocktail, or just finding a nice quiet spot under a shady tree with a good book. By far the most popular beach on Koh Samui. If you don't feel like moving too far off your beach towel the beach vendors will come to you, selling fresh fruits, cold drinks, ice-cream and freshly barbecued corn-on-the-cob. The hawkers will also come to you, particularly around the central part of the beach. You can buy everything from beach dresses, to fake Ray-Ban sunglasses or beach balls. If you're not interested just give a friendly smile and polite 'no thank you' and they'll leave you to it. For those who require a bit more than chilling from their beach there are plenty of activities available. We've got jet-skiing, kayaking, para-gliding, wake-boarding or just the mandatory massage on the beach. 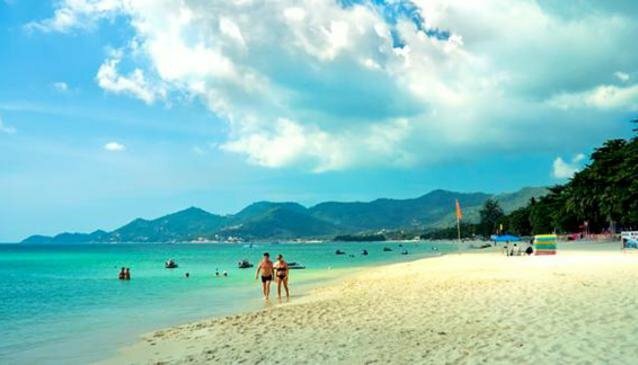 The south part of Chaweng has mostly big resorts and higher end accommodation, it is quieter and there are less independent bars and restaurants. Central Chaweng has a higher concentration of everything including tourists, but it is not over-crowded by any stretch of the imagination. North Chaweng is pretty much an extension of central Chaweng, a few less people and the sea is little less inviting, emphasis on little.